Millions of Americans and their sleep partners are affected by snoring. This can be an isolated problem or a symptom of more severe sleep disturbances such as obstructive sleep apnea. A thorough evaluation is indicated to identify the sleep disorder and provide the best treatment options. There are several procedures (e.g., Pillar implants, LAUP, UPPP) and numerous sleep aids to assist in the reduction of snoring. 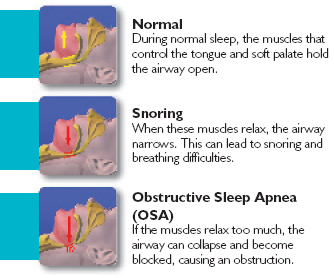 Snoring can be a sign of sleep apnea, where breathing stops or is suppressed during sleep. Symptoms include pauses in breathing, restless sleep, frequently awakening, daytime fatigue and un-refreshed sleep. Sleep apnea can result in a drop in the oxygen level in the blood during sleep causing strain on the heart and lungs. Contributing factors to sleep apnea include nasal obstruction, enlarged tonsils, elongated palate and weight gain. A thorough head and neck examination and a sleep study are frequently used to diagnose this disorder. Several medical and surgical treatments are available to patients suffering from sleep apnea.